●Food grade, durable stainless steel material. ●Wall thickness min. 0.8 mm. ●Stock pots comprise 5 mm fully encapsulated aluminum thermic base. ●Available in 6 litre to 225 litre capacity sizes. ●Riveted stainless steel handles & lids which don't get hot. ●Interior and exterior ‘fine satin’ finish makes for easy cleaning and reduces the signs of use. 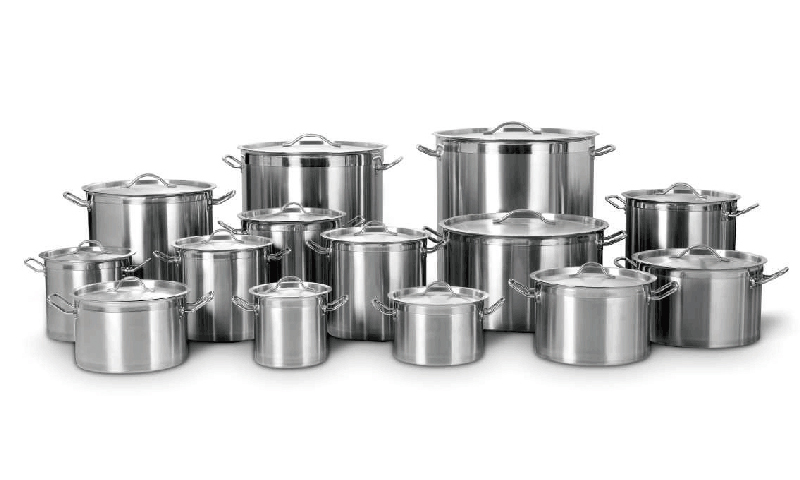 This range of stock pot is designed for professional cooking. With two grades of stainless steel (AISI 304 & AISI 430), combining the heat distribution of aluminum with the durability and magnetic properties of steel to allow induction cooking. This guarantees the corrosion resistance and optimal heat conduction. • Do not allow children to get close to the stove while cooking. • Never leave cookware on heat resource without food or liquid inside. • Never let food or liquid boil dry, and always use gloves or towels to hold the hot cookware. • Remove all packaging and labels. Please recycle waste properly. • Wash the pan in hot, soapy water, then rinse and dry thoroughly. • It is beneficial to condition the coated surface before using the cookware for the first time. Rub a film of cooking oil over the surface, heat the pan for 2 minutes over a medium heating, then cook and rinse it with hot water, softly dry with a towel. • To prevent sticking, spray pan with nonstick cooking spray or add a small amount of oil, margarine, or butter to a cold pan. Heat on medium temperature for one to two minutes before adding food. • Be sure your cooking surface is level. Burners and stoves that are not level may cause fats to pool: pooled fats and oils do not adequately cover cooking surfaces. • Clean pan thoroughly after each use. Food films cause sticking and discoloration on the pan when pan is reheated. • Sticking may also be caused by high heat. When fats or oils smoke, the heat is too high. • To avoid salt damage (small white dots or pits), add salt after food getting cooked or after liquids getting boiled. Pitting does not interfere with cooking performance, but it can diminish the appearance of the stainless steel. • Do not store foods seasoned with salt in cookware. • Do not use steel wool, scouring pads, oven cleaners, bleach or strong abrasive cleaners to wash your cookware. All of the cookware will last longer and look better if washed by hand with hot soapy water. • Using plastic, wooden or rubber utensil for coated cookware is recommended. • To remove white film caused by starch or water minerals, rub with sponge that has been dipped in lemon juice or vinegar, then wash with hot, soapy water. • To remove food burnt to the bottom of cookware, boil a mild solution of vinegar and water for 10 minutes to disclose food particles.